In our body's organ of hearing (ears), each Middle Ear (Tympanic Cavity), is an air-filled cavity and structures directly behind and internal to the tympanic membrane (eardrum) and external to the labyrinth (inner ear). In our body's organ of hearing (ears), there are three (3) left and right pairs of Auditory Ossicles (Middle Ear Bones) are a mobile chain of three small bones that make up our middle ear (tympanic cavity) in the cranial bones of the skull (cranium). In our body, the pair of Scapula Bones (Shoulder Blades) are two (2) of the four (4) shoulder bones that are part of the pectoral girdles (shoulder girdles). In our body, the Scapula Bones (Shoulder Blades) have two important processes, the acromion process and the coracoid process. 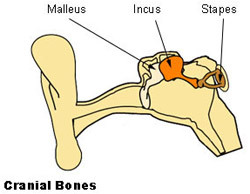 In our body's ears, in each of the middle ears, the two Middle Ear Joints of the middle ear ossicular chains include the incudomallear joint and the incudostapedial joint. In our body's head, the Eustachian Tube (Auditory Tube), aka Pharyngotympanic Tube, is a narrow passageway that connects the upper part of the throat to the middle ear (tympanic cavity). In our body's head, Eustachian Tube (Auditory Tube) connects from the chamber of the middle ear (tympanic cavity) to the back of the nasopharynx.